* Defeats all known barriers such as sheet metal, sheet rock, windshields, plywood, heavy winter clothing. 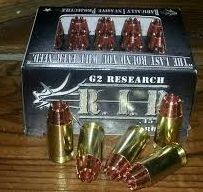 The invention of the G2R's projectile R.I.P.™ is related to the ability to control the way the projectile reacts as it passes through different mediums by control of the mfg process, geometry and the rate of failure at different zones along its axial length. More particularly but not limited to the ability to take the projectile and predictably have it stay solid in one medium but yet have the exact same projectile predictably react as a fragmenting bullet through a different medium without alteration of the projectile. The geometry at the tip of the projectile has much to do with the way the projectile travels through tissue. It has been long known in the medical industry that a trocar point penetrates the dermis layer more efficiently. Patents for trocars appeared early in the 19th century, although their use dated back possibly thousands of years. It is the use of this geometry at the front end of the projectile that does specific work at the point of entry from one system to the next. Dependent on the medium the projectiles geometry is designed to react differently. Imagine a Hole saw. The hole saw action that occurs at points of entry into different mediums reduce initial drag which allow the hollow cavity in the center of the projectile to rapidly pack. In the case of plywood the hole saw action cleanly cuts and packs the projectile with a slug that makes it solid thus allowing it to conserve more of its energy. This performance could prove to be very effective for law enforcement that may be in a situation where the target is behind such an obstacle whereas more energy will be carried into the intended target and not lost in the obstacle. In a fluid the projectile fragments. Due to the trocar geometry of each petal the resulting diameter of the fragmentation pattern is maximized. The trocar tips allow the fragments to swim through tissue / gel with less resistance thus conserving energy. The cross sectional thicknesses and geometries also create a full 180 degree flip halfway along each of the 8 petals path. The resulting shock wave and wound path is maximized. The result is devastating. G2R's relentless study and applied physics have derived a radically invasive projectile that outperforms the rest.